While the Medela Brand disposable nursing pads did a great job drawing away excess milk, absorbing it, and keeping the surface dry, I was a bit disappointed in the "stickiness" of the adhesive. The one small spot of tape did a poor job of keeping the pad "stuck" to my nursing bra, especially when I would fold down the flap to nurse. After an embarrassing experience involving my nursing pad falling on the middle of a busy restaurant floor, I decided it was time to switch. 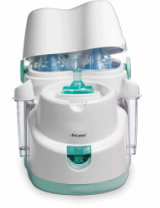 Get some at Babies R Us, or anywhere that sells Medela Products. My mom always told me, "If you don't have anything nice to say, then don't say anything at all". Well, I don't have anything nice to say about the NUK reusable nursing pads, so I'm not going to say anything at all. If you want to give them a try, buy some at Babies R Us, or any other store that sells baby stuff. One way to relax sore muscles and help increase your milk supply is to use heat therapy. This is easily achieved with a microwavable rice bag. It's a safe alternative to electric heating pads, and many rice bags come with relaxing, scented filling that helps you wind down after a long day, and produce more milk for your baby. Make your own or buy one at Bed, Bath and Beyond! Before breastfeeding, I rarely wore a bra to bed, and when I did, it was either a cami with a built-in bra, or a sports bra. After my milk came in, I started wearing a bra 24/7. My advice is to purchase ones that you think are comfortable, and durable, and to consider going wireless (read about how under wire can damage your milk production). I purchased four bras from Motherhood Maternity when I was pregnant, and still wear them to this day. I had a hard time getting comfortable during my pregnancy, and sleeping got to be next-to-impossible by my 40th week. I also had difficulties sleeping on my left side, as directed by my OBGYN. At about 6 months, I got a Boppy Total Body Pillow, which was an absolute lifesaver! It ended my restless nights, sore muscles, and helped me stay on my left side. You can get one just about anywhere, like Babies R Us! If your baby is going to be riding in an infant seat during the cold months of winter, I would highly suggest getting a car seat cover. It's an elastic-rimmed blanket that slips over the entire car seat, and keeps your baby toast-roasty warm! "The Especially for Baby" brand, available at Babies R Us, worked great for our Chicco car seat, and matched nicely. It zips up the middle, and has a peep-hole at the baby's face. Some car seat covers completely cover the baby, and this made me nervous! We just draped a blanket over the car seat's handle when we took Lucas outside. We travel A LOT, so I thought that I would use this on a regular basis. My mom recommended that we get one, because she had one for my bottles that she used all of the time. However, this particular brand didn't work at all for us. It took practically FOREVER for it to heat up the milk! I used Dr. Brown's bottles, which are tall and skinny, and the bottles would get extremely hot, but the milk wouldn't heat! It would take less time to just leave the bottle sit out and allow it to come to room temperature than it would to use this product. Perhaps mine was just a lemon, but other reviews on this product are similar to my experience. You can try your luck and get it at Babies R Us or Target. If you're looking for a quick and easy way to heat bottles, this bottle warmer is great. It's made by the same manufacturer as the Pro model, but it is much smaller, and quite portable. It works very quickly, and heats a 4-ounce bottle of milk in less than a minute... which is very valuable when your baby is ready for a bottle RIGHT NOW! 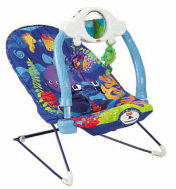 The price is not much less than the Pro model, and you can get it at Babies R Us or Target. If you're planning on bottle-feeding your baby, this is the best bottle warmer you can get. There was a time where I was pumping milk and giving Lucas bottles, and this was GREAT! It has a cooler on the back where you can keep two bottles cold with an ice pack, and a warmer in the front. You add a small amount of water to the warmer plate, and it steams the bottle warm, rather than placing it in a pool of icky water. The warmer comes with a guide (located on the side) for dosing the appropriate amount of water, and has an auto-shut-off mode. You can get it at Babies R Us or Target. I'm going to give this item TWO thumbs up. While it is practically the most expensive car seat and stroller combo out there, it is MORE than worth the investment (From Babies R Us or Target). The car seat has one of the highest safety ratings, the car base is the most convenient I have EVER seen, and the car seat snaps securely into the stroller. The car seat can be used with or without a base. 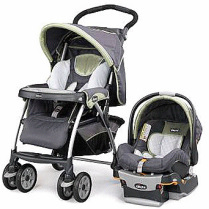 Most of the travel systems I have seen are not as durable or high quality as Chicco. This system comes in a large variety of colors and patterns, and is completely machine washable. We received a Shermag Rocking Chair as a Christmas gift from my Husband's parents, and I absolutely love it. It's a great place to feed Lucas, comfort him, and read him stories before bed. We keep it in his room, next to his bed, which allows me to have a private place to feed him while we have company over. The fabric is easy to surface-clean, but is not machine washable. I've spilled lots of stuff on it, and cleaned lots of spit-up off of it, and it has no stains. Because it is a bit on the expensive side to purchase this particular chair, I imagine that you could purchase an similar model in an alternate brand. Lucas absolutely loved to be swaddled when he was first born, but would wiggle his way out of the blankets, and then cry to be wrapped up. A friend recommended a Swaddle Me (Available at Target and Babies R Us), and it was an absolute lifesaver! My husband and I found it easy to use, and easy to clean. Lucas wore a size small until about 6 weeks, and that's when he started disliking being swaddled. We had a fleece version and a cotton knit, and used them both religiously. We received an older model of this Fisher Price Baby Monitor (available at Target or Babies R Us) as part of our hand-me-down haul. It's a pretty basic baby monitor, that comes with one AC adapter-operated, and one battery operated monitor. The transmitter is 120V-outlet operated, and has a light-up feature. This American Red Cross 7-piece Health Kit is great for travel, and comes with a zippered pouch that is easy to toss in a diaper bag. It comes with two medicine dispensers, nail clippers, a ball syringe, and an absolutely awesome thermometer in a case. The thermometer is worth buying this kit in itself, and I've been unable to find it separately. The American Red Cross makes larger versions of this kit (which include grooming tools), but I've found that this one is more than sufficient. Working at a daycare, I used thermometers constantly, and learned the value of a good one. Unfortunately, this Safety 1st Hospital's Choice Exchangeable Tip 3-in-1 Thermometer Set is NOT one of them. The quick-read feature produces an inaccurate temperature, and the attachments are difficult to install and remove. I had to use it 5 or 6 times before obtaining an accurate temperature, and the oral and underarm attachments gave a different reading when I tried using both. I'm giving this Cart and High Chair Cover (at Target or Babies R Us) a sideways thumb, not because it isn't a good product (because it is! ), but more so because we don't really have too many practical uses for it. We use it occasionally when going to the grocery store, but because Lucas is still in an infant car seat, we often just plop that into the cart, Also, we have the Chicco Travel High Chair, so we never need this at restaurants to cover the high chair. As Lucas gets older, and is in a toddler car seat, I can see us using this more at grocery stores, and in restaurants once he outgrows the travel high chair. As part of a hand-me-down haul from a friend, we received this baby bath tub. After discovering how much Lucas loved the water, I thought that we would use it all the time. However, after about three baths, my back was aching from bending over the side of our bathtub to reach the baby bath inside. For that, I give the baby bath a sideways thumb. So we stopped using the baby bath, and just putting Lucas in the "big" tub with me. Made life a lot easier, and turned taking bath into a relaxing time for both of us. Clinton and I looked into getting a travel high chair at Babies R Us, but they ran about $50.00, and around $33.00 at Target. We checked into a couple local resale shops, but they didn't have any in stock. A couple of friends of ours found one at a garage sale for $5.00! The fabric is completely removable and machine washable, so I was able to clean it up very easily, and it was like brand new! It breaks down flat, and comes with a carrying bag. It holds up to 37 pounds safely. Now we carry it around in our trunk, and use it at every restaurant we go to. It fits on tables, as well as in booths, and Lucas never has to sit in a dirty public high chair ever again! Though I was originally opposed to sling-style baby carriers, Clinton convinced me to purchase one at a mom-to-mom sale. When I started using it, I found it difficult and awkward, but Lucas loved it! He would stop fussing immediately upon being squeezed into the pouch, and sleep as long as he was inside. There are MANY ways to wear and carry your baby using a sling, from birth through toddler-aged! I later came to realize that the sling carrier I was using was too big for my 5 foot tall frame. I received a promotional code for a free carrier from Seven Slings, which allows you to order a carrier based on your height and weight. I also own a Peanut Shell carrier, available at Target.